What a week! I’ve kept busy at a business conference and have been using all my spare time to do a final edit for the brand new Soap Crafting book that will be out in a few months. I can’t wait for all of you to read it! I did manage to royally jack up my very-pregnant-back while traveling to and from the business conference so I predict some chiropractic and acupuncture in my future. But, before that, I did have a wonderful time browsing our Facebook photos for this week and I’m ready to announce the Facebook Photo of the Week. Don’t know what that is or how to enter? All you need to do is become a fan of Bramble Berry’s Facebook page and post pictures of your soapy creation throughout the week. At the end of the week, I choose one photo to feature in a blog post here at Soap Queen. Want some inspiration for your projects? Check out previous weeks’ photos here. This week’s photo comes to us from Monica of Green Lady Creations. Monica submitted this gorgeous photo of raw soap in the mold and I was completely smitten. 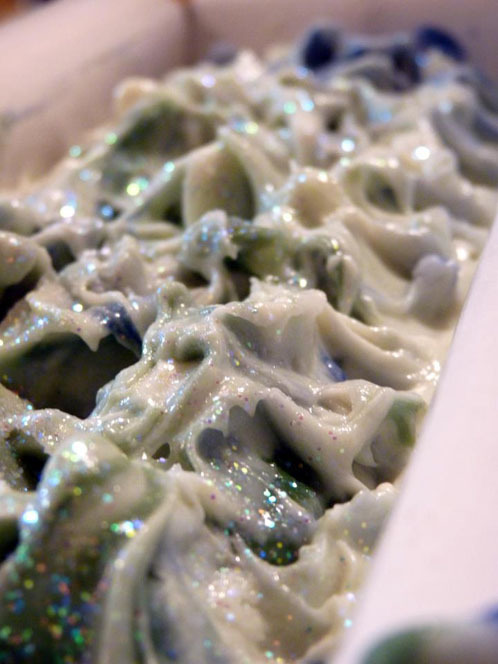 The glitter and the textured top made me want to run (errr, limp) up to the soap lab and whip up a batch of fresh cold process soap myself. 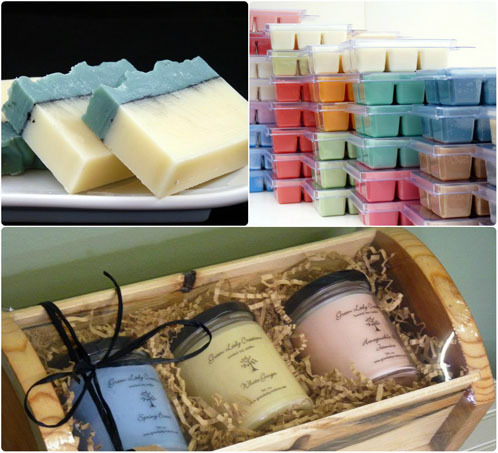 Thank you so much for being part of our amazing soapmaking community on Bramble Berry’s Facebook page, Monica! Expect a special little box of goodies to arrive at your doorstep soon. Fizzies, Lip Balms, Seizing Soap – Oh My! Stupendous Saturday Continues Facebook and Instagram Photo of the Week (Sept. 12th ~ 18th) Soapy Social Media Roundup Diary of a Crafty Chica & More! Beautiful soap Monica. Anne-Marie picks well. Sorry you hurt your back Anne-Marie! Wow! The top of the soap is gorgeous! Love Monica’s creation! Thanks for sharing with us! Thank you so much for choosing my photo for your photo of the week. I am humbled by your gracious words.